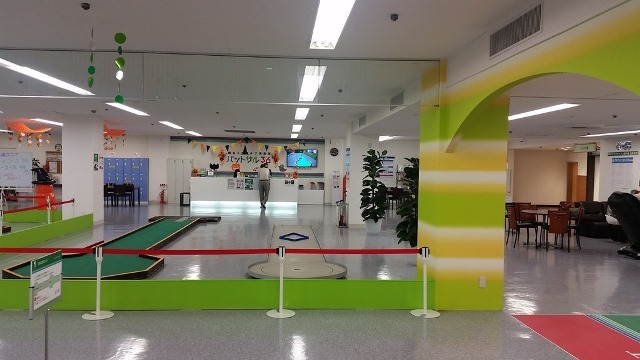 FUN-SPORTS has more than 25 years of worldwide experience on building recreational areas and we have successfully specialized on building minigolf courses. From planning through production and installation all the way to starting your business, you get always everything at FUN-SPORTS. We will also consult and support you beyond the starting point, when your business is already running. 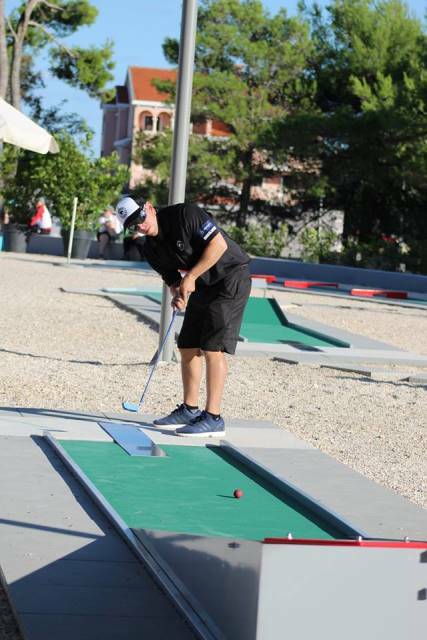 Our product assortment includes traditional minigolf courses as well as newer courses with more recreational target groups. We can offer solutions in all sizes and for all budgets. You can trust in us. We will build your course with lots of commitment and in close cooperation with you. We deliver everywhere, no matter if to Germany, Europe or elsewhere in the world. In the following we would like to represent some of our successful projects. 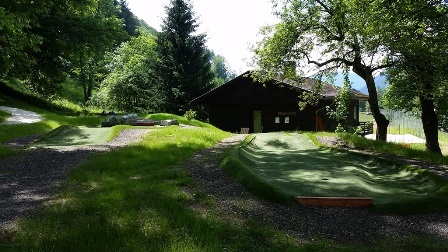 In the winter 2017-18 we started the planning for an adventuregolf course for Seecamping Berghof at Lake Ossiach in Villach, south of Austria. Seecamping Berghof is a big camping with space for more than 1.500 people. 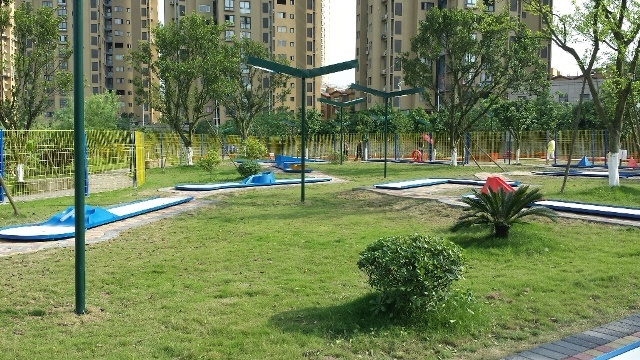 The guests want to be entertained and they already had an old miniaturegolf course on a large piece of land. 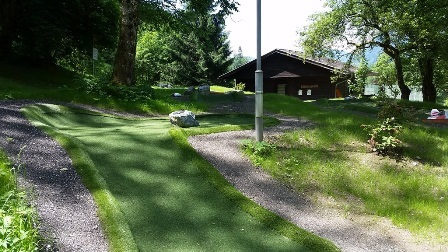 The owner family Hartinger-Ertl wanted to upgrade the minigolf and build an adventuregolf course to that area. They had a pretty clear vision how to use the available square metres effectively. We found a partner and material supplier for this project from Finland. Our old friend Jouni and his company turf.fi were ready to step onboard. Together with another old friend Aqil Aydinov from Azerbaijan we did the planning, prepared the drawings and could start the construction in April. The local team of company Bernsteiner took care of the excavation and preparation works in perfect cooperation with us and we all had great fun on site. At the end we installed the turf and took care of last details and the course was ready to play for the main part of the holiday season! 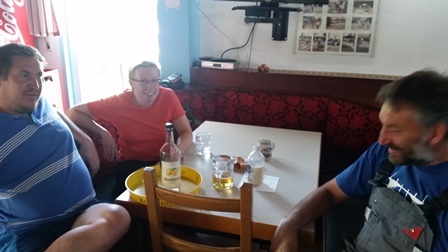 When Peter Kramer called in January 2018, we talked for about half an hour and decided to meet next week in Ludwigsfelde (between Berlin and Potsdam). Both had a feeling that we understand each other well and Peter would realize his project quickly with us. Peter and his wife are operating a wholesale market for fruits and vegetables and have a small, beautiful shop with cafe on the side. Peter wanted to make the visitors stay a bit longer than just for a coffee and he had a clear picture in his head, how much he wants to invest in the adventuregolf course. This budget was for us a good guideline when we entered the planning stage. 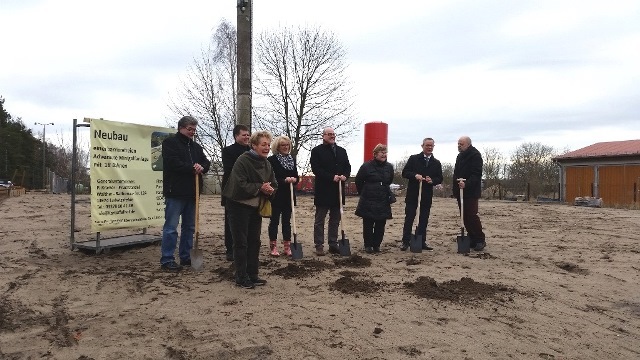 The area for the course was already a bit prepared, so the groundbreaking could take place in March in the presence of the press and several regional politicians. In May it was time for us to start our work. Few weeks later we were ready and then the first lady of the house was on to show her landscaping and decoration skills. Due to the extreme temperatures the ground never became really green this summer, but we are sure it will look very different next summer. The soft opening took place in July and at the end of August the course was officially opened. Many politicians were present again and praised the course as great thing for the region. 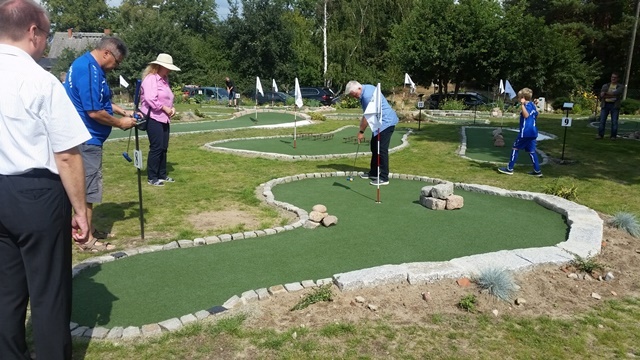 Meanwhile a business relationship has developed into a friendship with Peter and he, his family and many friends have already started to become true minigolf fans! Have a look there if you are in the hoods. You will not be disappointed! As it was already since long time clear that the spring would be very busy for us, we received a letter with a tender for feltgolf type A course. 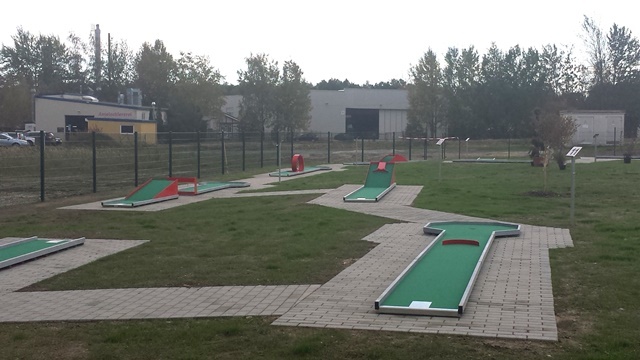 The city of Bad Lauterberg had already a couple of times tried to find a supplier for steel feltgolf, but the chosen competitor company could not fulfil the formal requirements for this public project. So the course could not be built so far. At Fun-Sports such requirements are of course fulfilled and there were no hurdles to give us the order for this course. 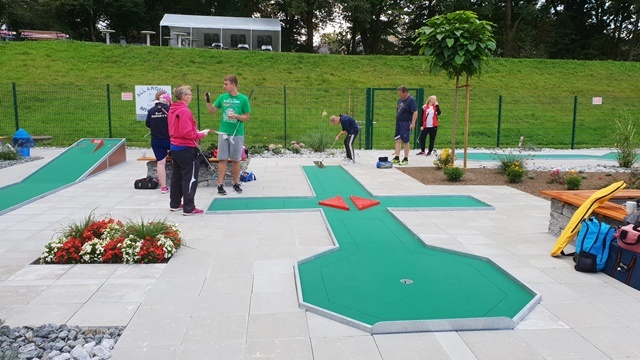 Not only the future operators of the course (mainly sport enthusiasts from the tennis club next door) but also the staff at city hall were relieved that there finally would be a feltgolf course in Bad Lauterberg. The courses were installed just-in-time for the opening event despite small delay and the course was ready to open for the school holidays. The operators are ever since impressed by the high demand and great number of guests. The long summer and warm weather have prolonged the season nicely. We would like to thank Gero Fröhlich and the rest of the stakeholders as well as especially Sören Teuber from Conterra Planungsgesellschaft mbH for the good cooperation and we are looking forward to further projects together! 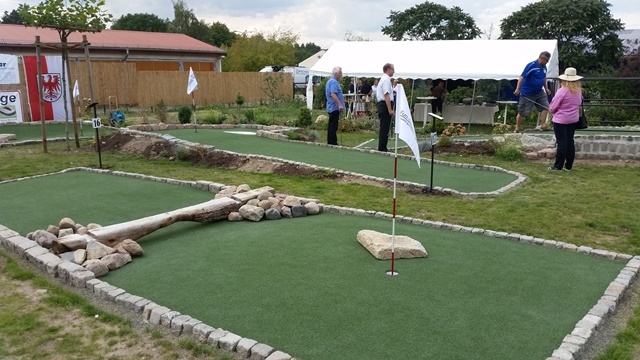 Roughly 1,5 years after the first meeting the construction of a feltgolf type A course in FunPark Eickel was finished and the course opened for players. 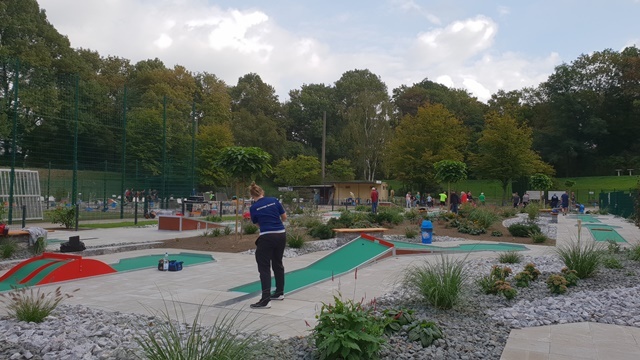 It is already the third competition course in FunPark and MGC Rot-Weiß Wanne-Eickel is one of the biggest and most active minigolf clubs in Germany. 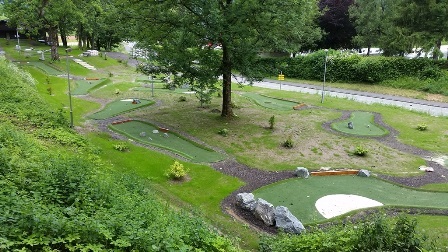 Already for decades the players have been playing on concrete and miniaturegolf in FunPark. 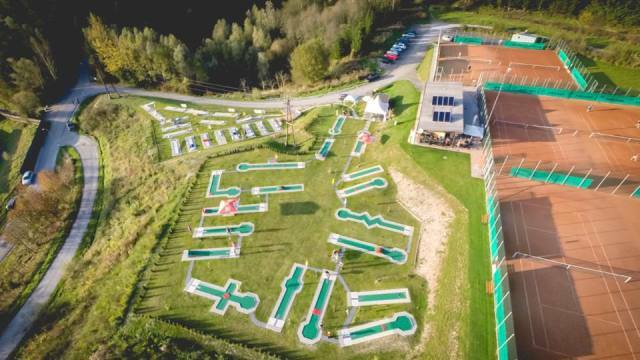 When it became clear that the clay tennis courts next to the minigolf centre would not be used any more, the club got an idea to build a feltgolf course there. 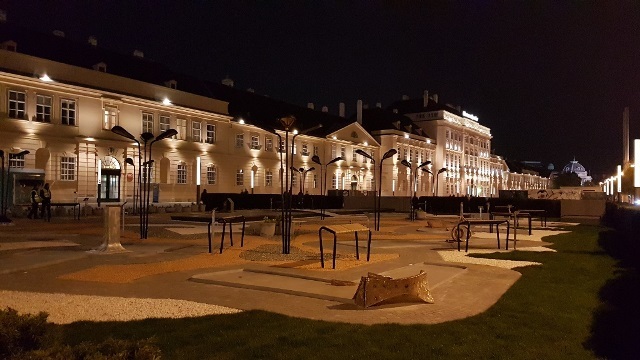 The first contacts with the city administration and Pasi from Fun-Sports were taken, and soon it was obvious that all parties would want to work for the realization of the idea. As already said, in January 2017 all parties met in the clubhouse for the first presentation of the project. 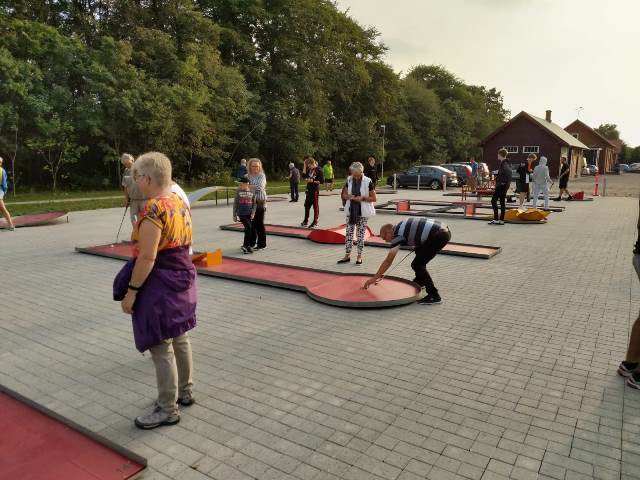 The district mayor Martin Korkmann said at the opening ceremony that he had already in the first meeting sensed a great enthusiasm for feltgolf on the club and Fun-Sports side! Of course there were still many financial and administrative hurdles before the project could kick-off, but when the sport council of City Herne and its chairman Bernd Fischer confirmed the city subsidies in June 2017, it was practically clear that one day the course would stand. At the beginning of 2018 the cleaning of the tennis courts started, and in April the court was prepared for the installation of the lanes. It is again and again worth mentioning that everything you can see in the pictures, except the lanes, has been created by the club members. Especially Karl Drewermann and Andreas Senke need to be mentioned, as they both have spent countless hours on the course for this project! On September 15th, 2018 the course was officially opened in a nice ceremony. Among the speakers was also Michelle Müntefering, member of the state government and the local representative in the parliament of North Rhine - Westfalia. She had already had time to test the course in advance! 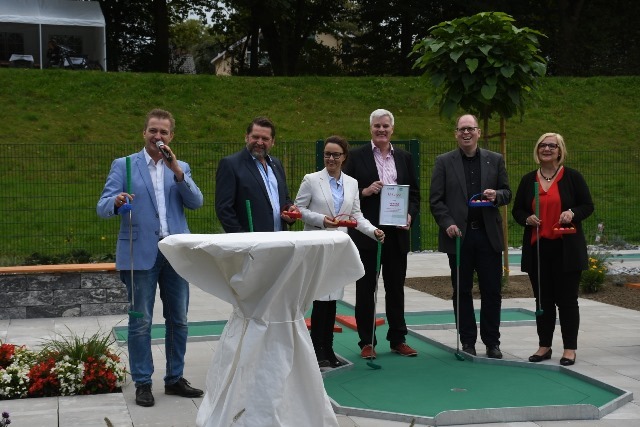 On the day after the opening the first official tournament was played on the course and so it was only logical that the German Minigolf Sport Federation announced in the opening ceremony the nomination of FunPark Eickel as official DMV training centre. 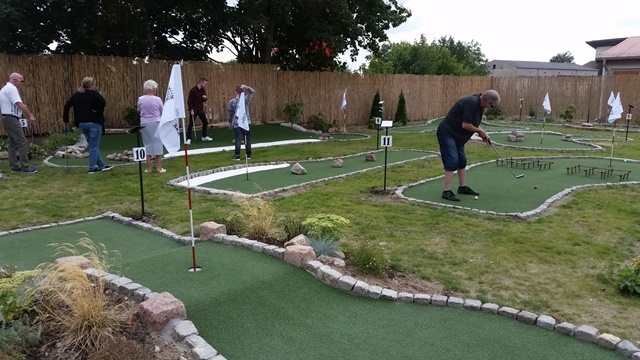 At the end of May 2018, in the middle of the busiest season we got a call from Leif Meitilberg, president of the Danish Minigolf Union. The federation wanted to rebuild two old courses together with new clubs to be founded on the sites. Leif told us to be next week in Denmark and install the courses! We were not quite that fast, but at the beginning of July we stand in Taastrup near Copenhagen on the first course and one week later the players had occupied that course. The second course followed at the beginning of August in Skals, in the northern Jutland. In both cases the federation also wants to test new materials for better surface protection of the plates, and so the lanes in Skals got a red colour. We shall follow the project with great interest and are looking forward to the next editions in the summer 2019. We also wish the new clubs good luck and lots of fun with minigolf! The clearly most interesting project of the past few years kicked off in 2016 with several planning meetings, so that the highway and the train route Nuremberg - Vienna became very familiar. 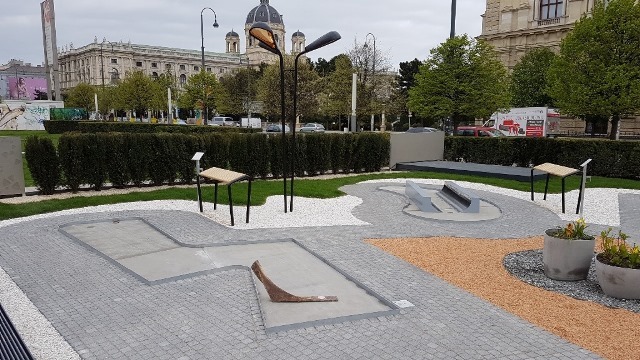 Museumsquartier, which is a true hot spot in Vienna wanted to bring new life to their frontyard and had the idea to introduce a public minigolf course there. Obviously the course should not be a regular course, but rather a piece of art and at the same time be well playable. The course area was designed by Daniel Sanwald, German architect living in Vienna. The concept reminds of beaches in Italian Riviera in the 1950s and so the course got its name MQ Amore too. The lanes were supposed to be from same materials than traditional miniaturegolf lanes, but with completely different shapes. 12 lanes were designed and the obstacles were created by five different artists or artist groups. The duo Matthias Bildstein / Philipp Glatz got eight lanes and the other four artists got one lane each. Our main task apart from delivery of the lanes was to coach the artists and Daniel, so that the lanes would be playable at the end. It was quite a challenge to get the artists to think about playability, but it was huge fun all the was and the result is truly amazing! 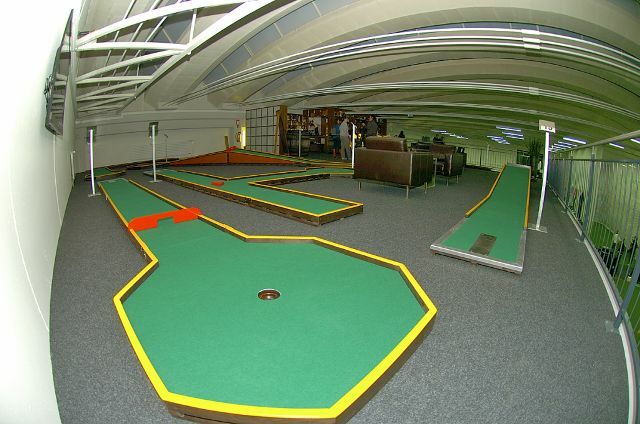 Austrian top minigolfers have played show matches on the course and every lane is manageable with one stroke. So we can be proud of our work! 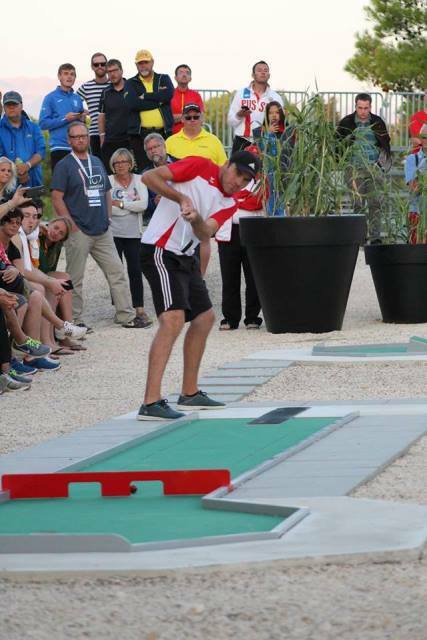 Minigolf World Championships 2017 took place in 2017 for the first time ever outside that traditional minigolf centres. The venue was Zaton Holiday Resort on the Adriatic Coast near the city of Zadar. The resort built for the holiday guests but also for the championships two new courses. Three years earlier they had already built an adventure golf course, which was also used for World Adventure Golf Masters during the championships week. Due to the long negotiation and preparation stage the courses were ready only shortly before the pre-championship tournament in June. The infrastructure around the courses was yet far from ready, but the tournament could be played in regular conditions and in September at the World Championships everything looked very different. 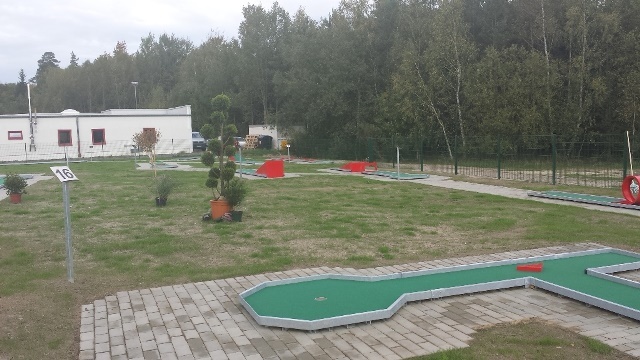 We hope the minigolf tour will one day return to Zaton and that the guests there will play many minigolf rounds whilke enjoying the attractions of the resort! 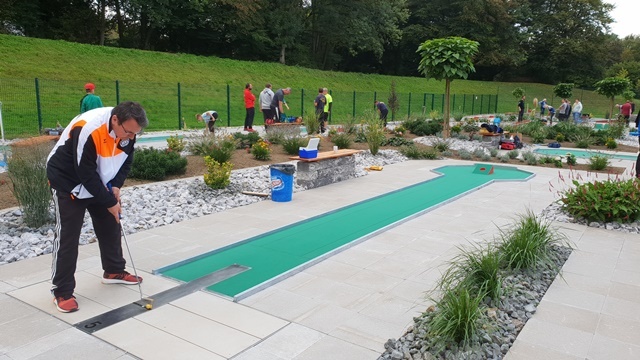 The picturesque small town of Clervaux (Clierf) in the Ardennes in the north of Luxemburg decided to have a new minigolf course in the municipal camping area. 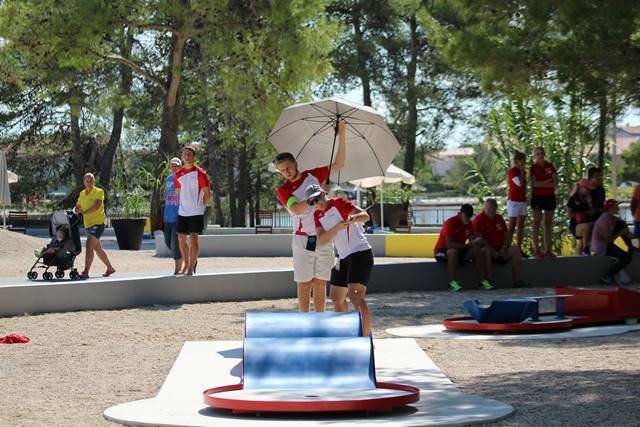 On recommendation of the experienced minigolfer Romain Bausch the minicipality chose Fun-Sports as supplier. 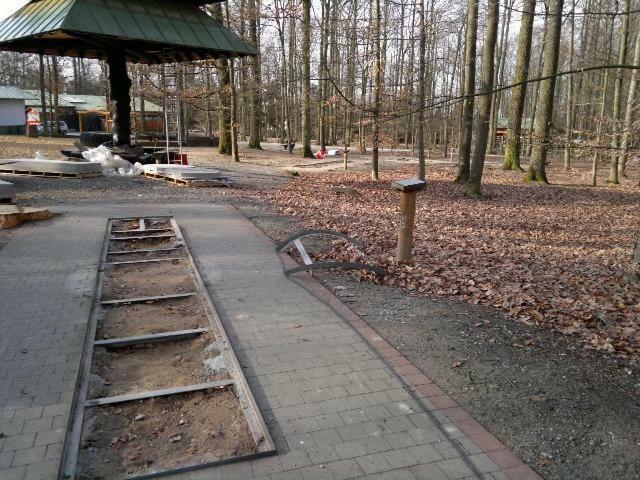 The prearations went quickly in February-March so that the installation could take place already in April. The area is not too big, but with good planning there was enough space for the 18 lanes. One can only be amazed how beautiful Clervaux is. We can recommend for example to combine a round of minigolf with a visit to the local castle almost right next to the course! 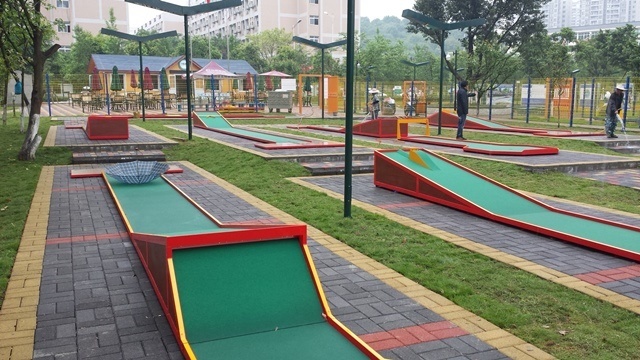 The planning of 12 Fungolf lanes with artificial grass surface began already in 2015, but the customer, the local conglomerate of farmers has to wait for a long time until the positive decision on public subsidies arrived. So the work could begin first in autumn 2016, but had to be finished quickly, because the deadline was set to Mid-November for receiving the subsidies. You can imagine that the weather was not always ideal in October, but we were able complete the work right in time! The cooperation with the team of Landmarkt, the shop on whose area the lanes are located was very pleasant. We are all looking forward to the spring 2017. Then the visitors can also play the lanes. 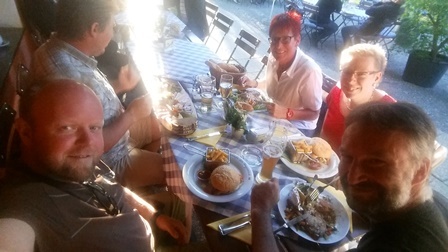 Rohtneschirmnach is deifinitely worth a stop if you are driving on the highway A38 between Leipzig and Göttingen. 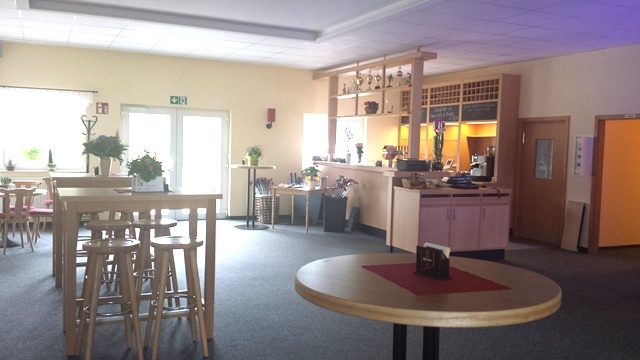 Delicious lunches, nice shop with local products and a round of Fun-Sports Fungolf! Two minigolfing friends from Switzerland, Sepp Hort and Andreas Kirst are meanwhile living in Denia on the east coast of Spain, near Alicante and Valencia. They wanted to keep the contact to minigolf sport and also to bring minigolf forward in the region. So they decided to build an own course near the centre of Denia. Fun-Sports quality was their choice and so the course was delivered and installed in August at nice summer temparatures (let us call 40 degrees Celsius like that...). The course of Club Minigolf Denia is located right next to the Restaurant La Ermita, which we also can recommend to the visitors. 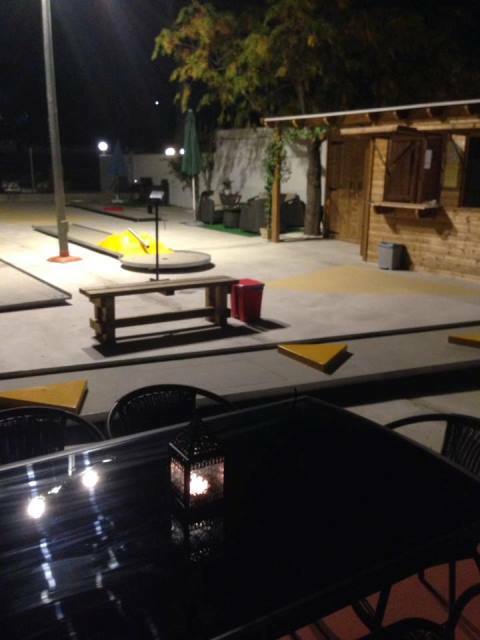 A delicious dinner combined with a round of minigolf make a nice evening in Denia. Especially the nice evening atmosphere is worth a visit! 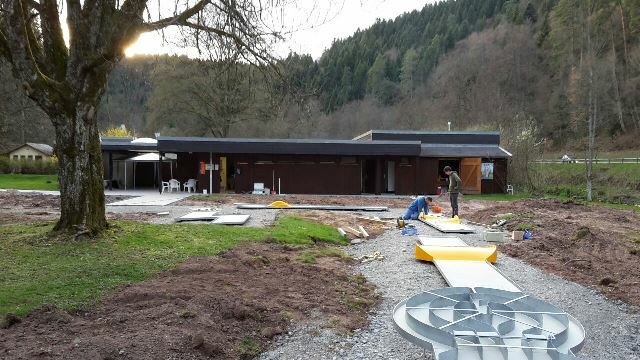 When the friends of Bahnengolfteam Wieselburg had played our course in Voitsberg, they knew whom to contact when it was time to renovate their own course. The old plates of the course built by another company were not playable anymore and so we were commanded to change all the plates and some new obstacles. Some of the old obstacles could still be kept and used. The workflow was very good thanks to the great help of club members, chairwoman Katja Schalkhaas and Thomas Pirgmayer mentioned as representatives for all helpers. We also had a great fun and got ready in record time in July 2016. Rare but true, we even had timefor a quick dip in the pools of the nearby swimming center before heading home. The first tournaments were played in September and we wish BGT Wieselburg the best of success in the leagues and lots of fun on the new home course! 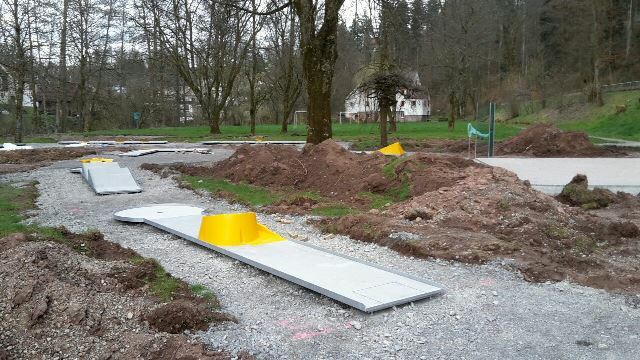 The administration of the town Altensteig in Black Forest region allowed itself a lot of time before being able to decide how to proceed with the renovation of the old minigolf course. It took almost three years from the first visit to the beginning of the construction, but never mind as long as all is well at the end! 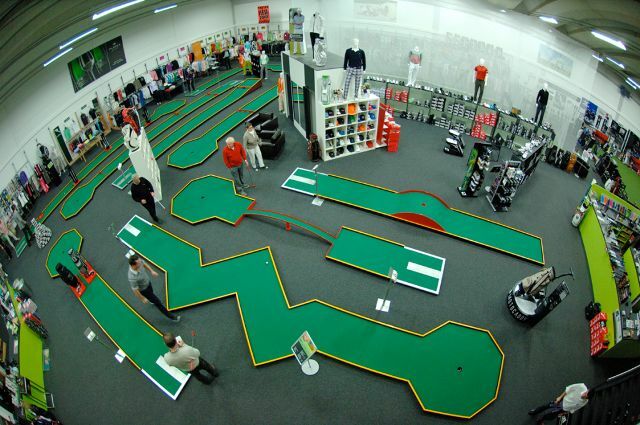 The decision was to build a completely new miniaturegolf course to replace the old one. As special feature all obstacles should be in the same yellow tone. No probs to us! 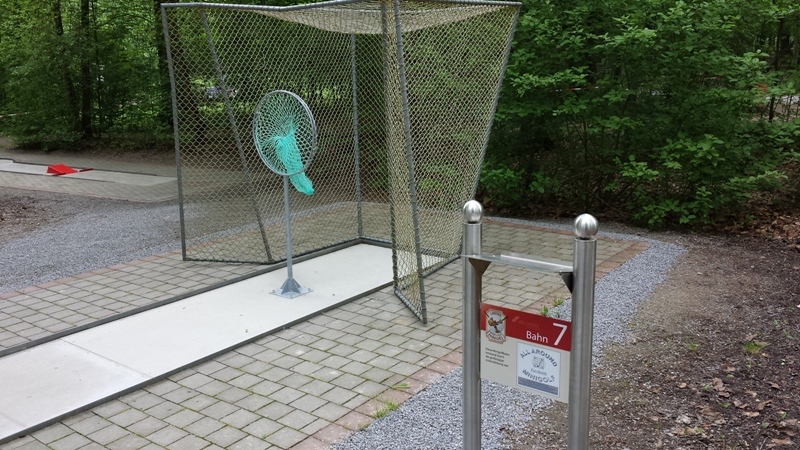 The installation was done in the spring 2016 right in time for the season start. There were heavy rains in the region in early summer, but not even they could stop the operation. 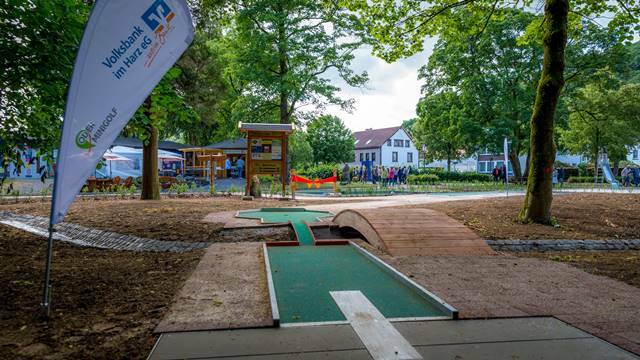 If you are driving in the Black Forest region, south of Stuttgart, we strongly recommend a stop and a round of minigolf in Altensteig! 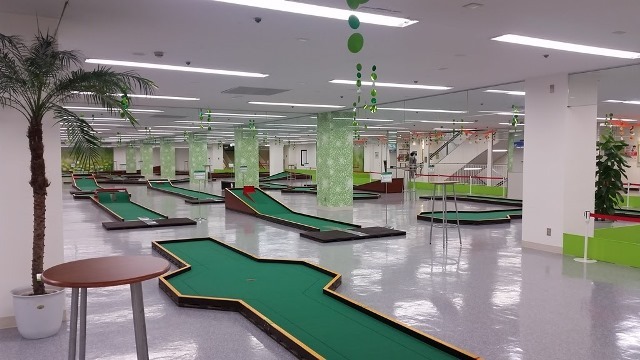 2 x 18 competition lanes inside a shopping mall - a dream of every enthusiastic minigolfer, right? And the dream has come true in Koshigaya, about 1 hour north of Tokyo downtown. By train of course, because you would not drive a car in the metropolitan area unless absolutely necessary... Puttsal 36 is the name of the minigolf centre in Sun City shopping mall at the Koshigaya Community Plaza. It is a project of Koshigaya Community with several public instances as owners. Mr. Kaneko from the Community visited Bamberg an Germany together with our Japanese contact and friend Kenji Oowada in October 2015 and together we saw several Fun-Sports minigolf courses in two days. Kaneko-san flew home convinced to have chosen the right partner and so the ball started rolling and prearations begun. Both courses arrived by vessel in March 2016 just-in-time and were installed in 6 days. The Grand Opening party took place on 9.3. The proud city mayor and representatives from sport and politics were present at the ceremony. The course has ever since developed to a hotspot of active minigolfers and new, enthusiastic club members and interested customers. 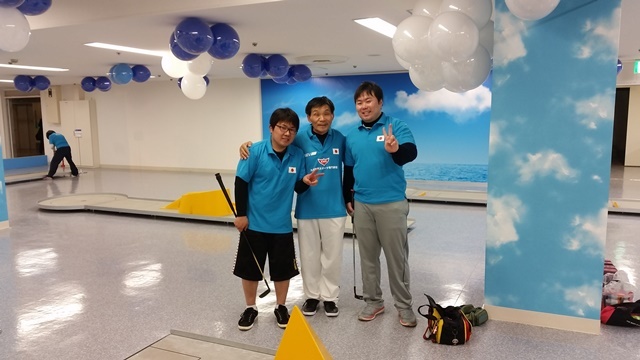 Three players of Koshigaya Minigolf Club participated at the Asian Championships 2016, among them the 11-year old Yuta who won the junior category! Koshigaya was and is a nice story. The trips to Asia are always interesting. Lots of old and new friends, unique experiences and som much friendliness! Arigato gozaimasu! 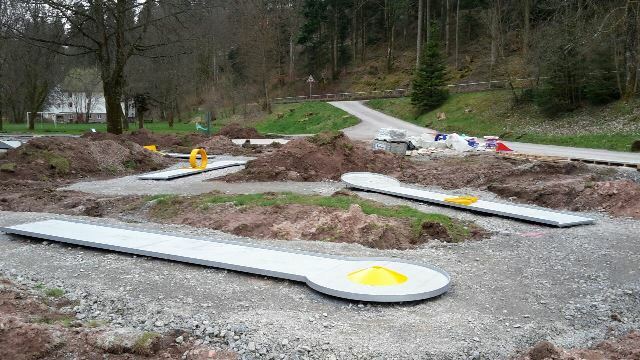 During the summer and autumn 2013 the first steps for the new minigolf centre in Voitsberg were taken. A truly picturesque, but also challenging location on a hill with a view over the town. 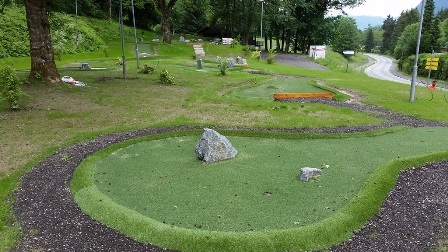 The owner Christian Gobetz negotiated with other famous minigolf companies too, but decided at the end for Fun-Sports. As he says, a perfect choice. The first part of the combi course (meaning two different systems with 18 lanes each) to be built was the feltgolf course in September 2013. 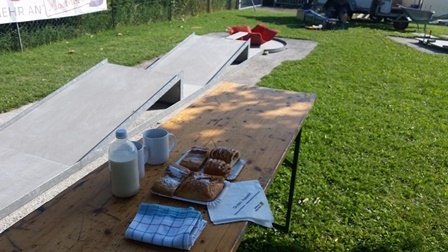 We had a nice installation week under the warm Styrian sun with helpers among others from the local jail! 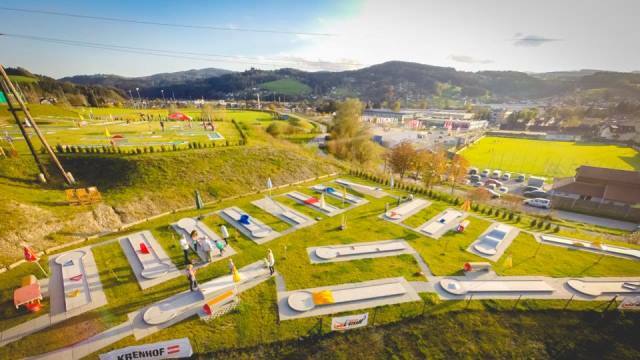 As Christian had bigger plans with his minigolf centre and the Austrian minigolf Championships 2014 were about take place in Voitsberg, he needed a second course as well. 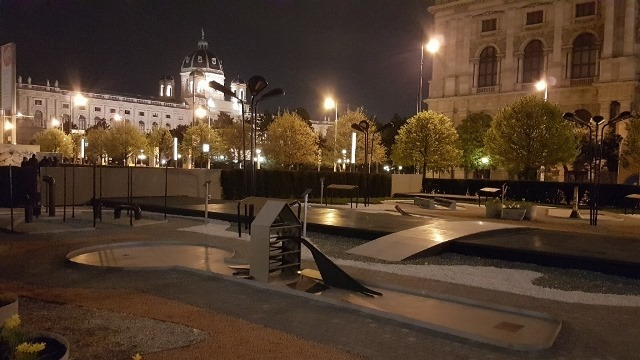 It was planned in all the way from the beginning and with friendly support of Austrian Minigolf Federation it could be realized in March 2014 without problems. It was to be a miniaturegolf course and like for the felt, also hier Christian chose some lesser known and interesting obstacle types. 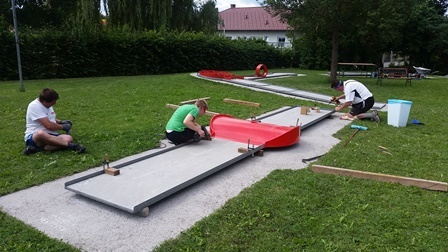 The feedback from players at the championships was very positive to both courses and the summer 2014 showed that minigolf now belongs as inevitable part to the life of Voitsberg citizens and their free time. We are happy for Christian and say thanks for trusting in us! A special kind of adventure was expecting the team of Fun-Sports when we travelled to install two courses in the Chinese province Chongqing in April 2014. Hechuan is a rather small city in the Chinese scale with just 1,5 million inhabitants and is located about 50 km from Chongqing City, but believe me - there is still fair bit of action going on in Hechuan too! The courses and the restaurant and clubhouse building were mounted in a university campus. The feltgolf course was manufactured to be transported in ready pieces which have the felt carpet already fixed in the factory. 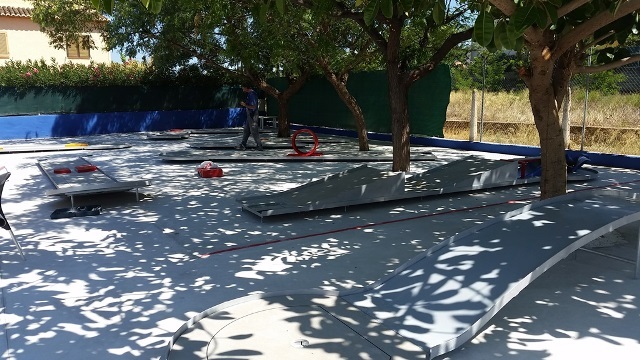 We usually do this, if the course needs to be mobile or the conditions for installation are special, as often can be the case in faraway countries. The courses survived the sea freight transportation nicely and we could install perfectly playable and beautiful courses! A couple of months later the forst competition took places on the feltgolf course and the results showed that our work had been successful. 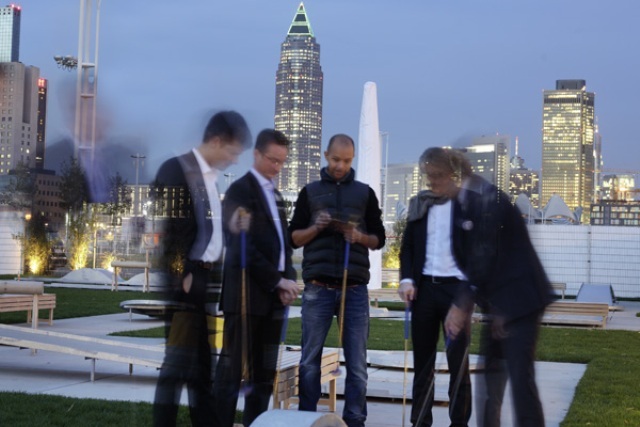 Once again we could show that no distance is too long for Fun-Sports to build a perfect minigolf course! Bowling in the winter, minigolf in the summer. That was the new business plan of Jörg Schmidt who had been running a bowling hall in the small town of Hermsdorf in the state of Thuringia in Germany. Bowling in the summer was not very popular though, so Mr. Schmidt had the idea to move to the outskirts of the town, build there a new hall including a sports bar and offer minigolf outdoors for the summer guests. Jörg Schmidt wanted to have something new and unknown in his region. 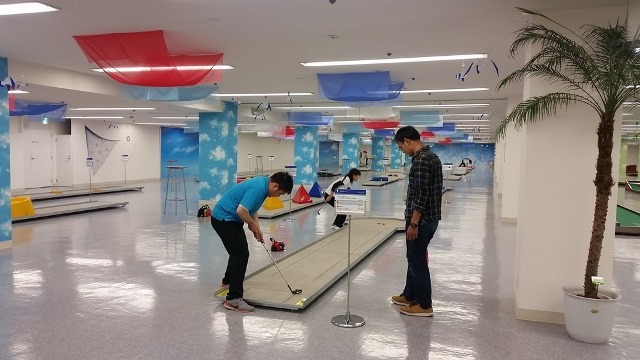 Minigolf is familiar to many, but feltgolf as form of minigolf is not. A competition-size course was too big for him though, so his choice was to be Type B, the biggest of our leisure feltgolf courses. Naturally the course was supposed to be made of modern materials, so the constructions are from galvanized steel which guarantees lowest possible maintenance costs. 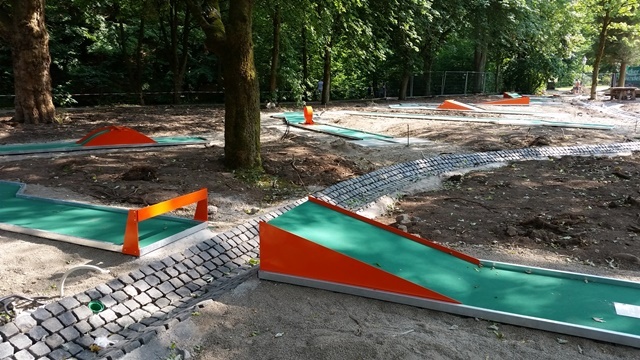 The green felt carpet and red, powder-coated obstacles and slope sections bring colour to the course, so the lanes definitely do not look boring! The grand opening took place on the German national day, on October 3rd, 2014. 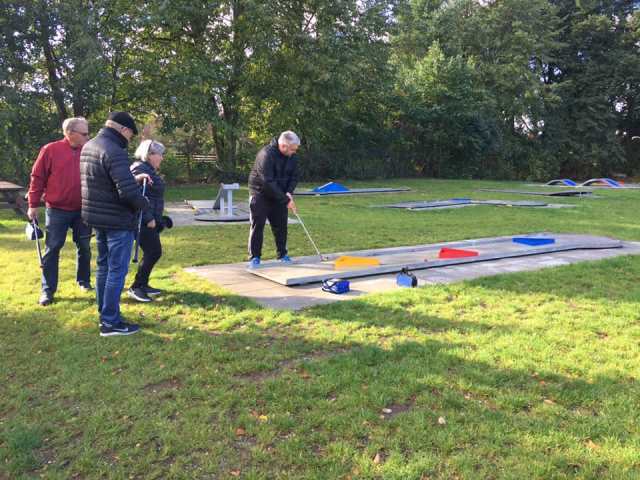 The warm autumn gave Jörg Schmidt many good business days after the opening and so the locals and otehr visitors could learn to know the feltgolf course and also the local press was writing very positive reviews. We at Fun-Sports do wish Jörg a good winter season with bowling and bar, and in the spring again good luck with the minigolf course! Europaviertel is a huge construction project in the heart of Frankfurt am Main. Office and living space is rising in the immediate proximity of the City, heart of the finance world. 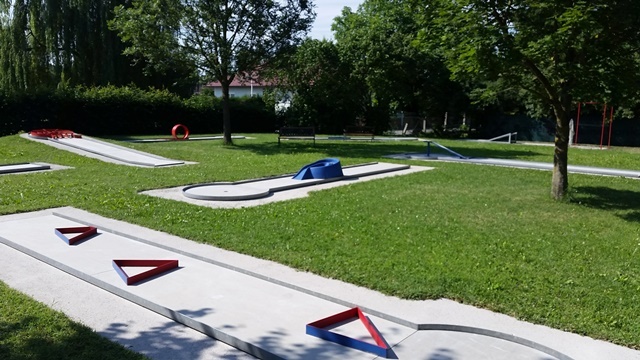 To upgrade the recreational offer of the area Boulevard MItte a miniaturegolf course was built in the block nr. 43 of the area. 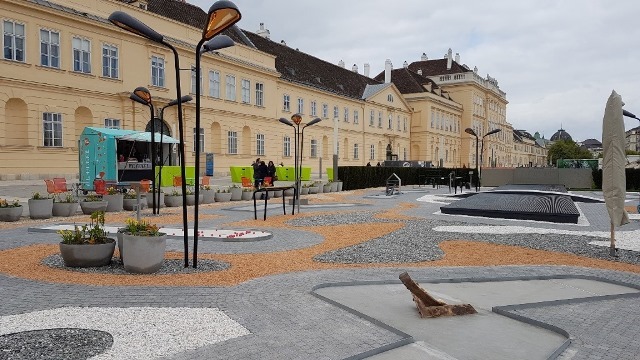 We implemented the project in the summer 2012 together with the client aurelis, the landscaping company BWP Endreß and the fantastic ladies of Activ Consult Real Estate (acre), who also have developed the concept Minigolf Handicap 43. The result is a lovely oasis, where everyone can enjoy a round of minigolf or delicious coffee and snacks at the Cube bar. The ambience is fabulous and the view to the Frankfurt skyline comes on top of it for free! In the summer 2012 we were contacted by John Furch from Malans in the eastern Switzerland. John and his business partner are running The Golfers, a golf shop combined with a noble whisky bar in Malans. 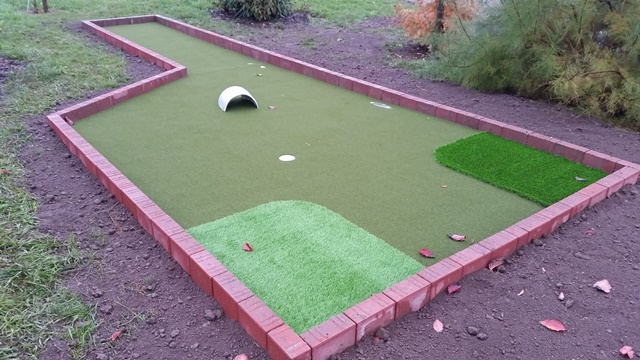 The guys wanted to add minigolf to their business, especially for the winter season. Feltgolf Classic was their choice, very suitable for golfers. There was not enough space at The Golfers for 18 competition size lanes. So there are nine smaller lanes upstairs at the whisky bar and nine tournament size lanes downstairs in the large sales room. The customer needed a customized solution, we delivered it and the result is worth checking out! 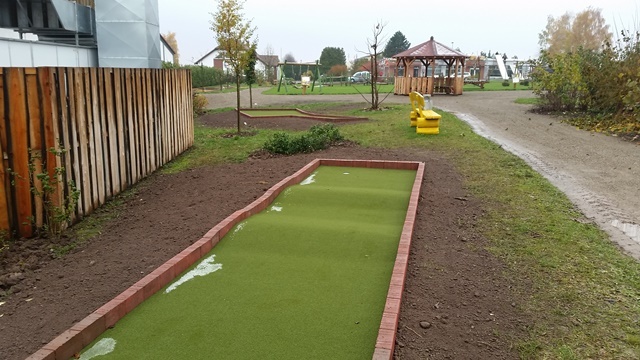 Right at the beginning of the season 2013 we renovated the public miniaturegolf course in the very frequently visited wildlife park "Wildpark an den Eichen" in Schweinfurt (Franconia), Germany. The park has more than 500.000 visitors per year and the course can be played without paying any fee. That means some heavy use of the lanes, and no wonder the old course was not in that good shape any more. As you can see in the picture above, when we had our first planning and measuring visit in February, it was full winter! In April at installation the snow was at least away, but the temperatures were not too high yet. But we had great support from the park staff and changed all the plates and obstacles in due time. The frames are anchored to the ground with concrete, so it was a bit more difficult than usual, but of course no problem at all for our experienced team to handle the situation! 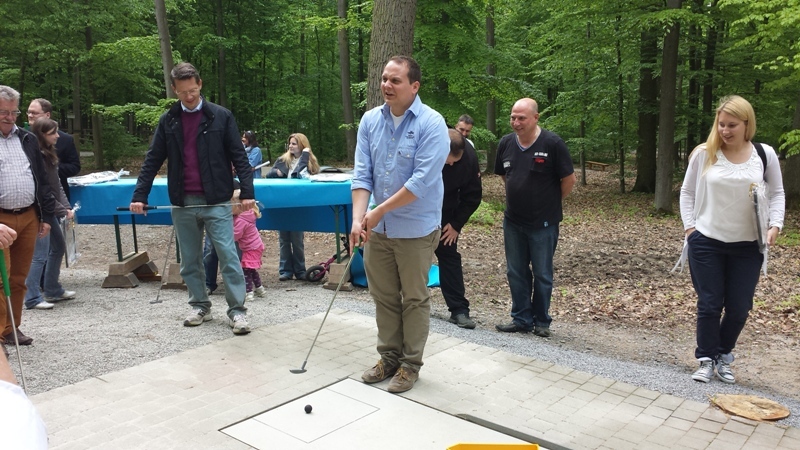 On May 11th Elk Lasses Minigolf Paradise opened its gates with a festivity act. 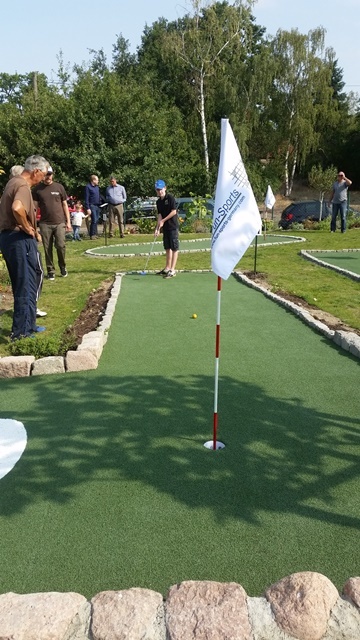 Every hole is sponsored by a company and for the inauguration of the course Mr. Sebastian Remelé, the mayor of Schweinfurt had to play against each sponsor on their lanes. Mr. Remelé did pretty well, but of course he had no chance against the experienced Pasi Aho on the Fun-Sports lane "skijump with net". After the round the mayor was delighted to receive a Fun-Sports professional putter as a gift from our company. He promised to use it as often as possible with his family and come to play in Wildpark!